Skydiving is the ultimate Adrenalin rush! Experience the unparalleled thrill of free-falling for up to 60 seconds at awesome speeds of approximately 200kph during a up to 15,000ft tandem skydive. Skydive from up to 15,000ft! Live the most exhilarating experience of your life...beach skydiving, the highest, fastest, most spectacular adventure sport of them all! Securely attached to your experienced and professional tandem instructor, you will be guided through your entire skydive. As the excitement builds, your expert instructor will prepare you for the countdown and together you will make the ultimate beach jump from 15,000ft! Experience the unparalleled thrill of free-falling for up to 60 seconds at awesome speeds of approximately 200kph. 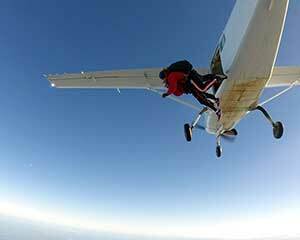 The initial speed and sensation of free-falling make skydiving an adventure that cannot be matched. Once the instructor deploys the parachute, relax in the serenity of a peaceful canopy ride and take in the sensational aerial views as you land between two of Brisbane's most amazing landmarks, Moreton Bay and the Islands of Bribie and Moreton, as well as the beautiful Glasshouse Mountains, which offers spectacular views when under canopy. Book Now! Staff were GREAT!! Amazing experience and I need felt in danger. AWESOME. Will be back with some more jumpers soon, thanks guys! I am very happy with my purchase had the most awesome time of my life. Just great. Will always recommend ? Thank you, awesome family bonding memory. Amazing experience. Would highly recommend this to anyone. Thank you to Dusan (hope I spelt that correctly). Felt totally safe and could not stop smiling. ?????? Absolutely amazing. Never thought I'd do this but Brett assured me and made sure i was calm. I would hands down recommend this crew!! Very professional and bunch of nice people. The reception crew were very helpful and the instructors were very professional in their approach to safety, and making the experience fun. The adrenaline team were fantastic to deal with.